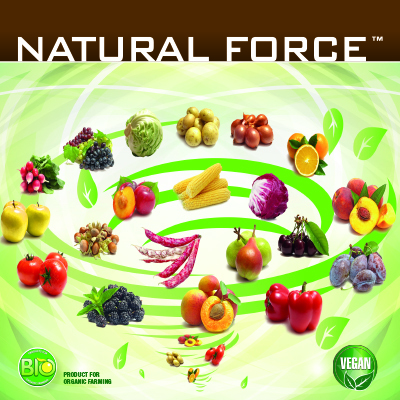 NATURAL FORCE is fluid PROTEIC CONCENTRATE COMPLETELY by VEGETABLE ORIGIN obtained from enzymatic hydrolysis on fruit and cereals. Compared to animal protein hydrolysts, NATURAL FORCE has not limitation use, in fact it can also be applied on edible plant parts like fruits. Where does come from NATURAL FORCE energy? 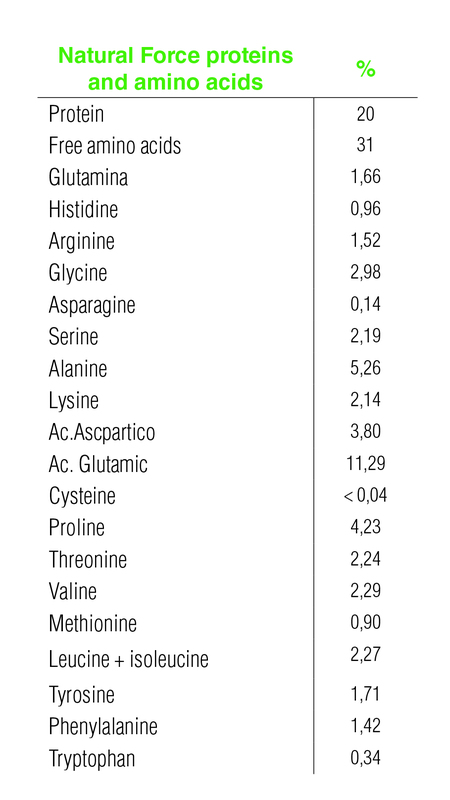 The NATURAL FORCE energy comes from by high concentration of amino acids and vegetable proteins (see table below). THE 99% OF AMINO ACIDS INTO NATURAL FORCE ARE LEFTHANDED, FOR THIS REASON ALL AMINO ACIDS ARE EASILY METABOLICABLE FOR CROP DEVELOPMENT. Nitrogen (3,2%): essential element for protein synthesis. Phosphorus: (3,9%) essential for ATP and of the phospholipids synthesis. Potassium (3,2%): fundamental element for sugar accumulation in fruits. NATURAL FORCE is the only protein concentrate on the market that can provide PHOSPHORUS. Reduce energy consumption thanks the presence leafthanded amino acid. Improve the overcoming stress conditions by presence of Proline. Stimulate the radical and vegetative development. Regulate the hormonal synthesis thanks the supplying of hormone precursors like proteins, peptides and amino acids. Stimulating chlorophyll and sugar synthesis by carbon skeletons from organic carbon. Improves the organoleptic characteristics into the fruits thanks Potassium contribution. Low salinity, a characteristic that determines a wide adaptability in all types of soil. Excellent miscibility with all formulations. Acid pH between 3.5 and 4.5 with acidifying action into the solution. NATURAL FORCE can be applied by drip irrigation with 30-50 L/ha or by foliar application by 3 L/ha from before flowering every 7-10 days with at least 3 interventions. In the case of deep stress conditions, it is recommended to use NATURAL FORCE alone by foliar application with 10-20 L/ha dose. 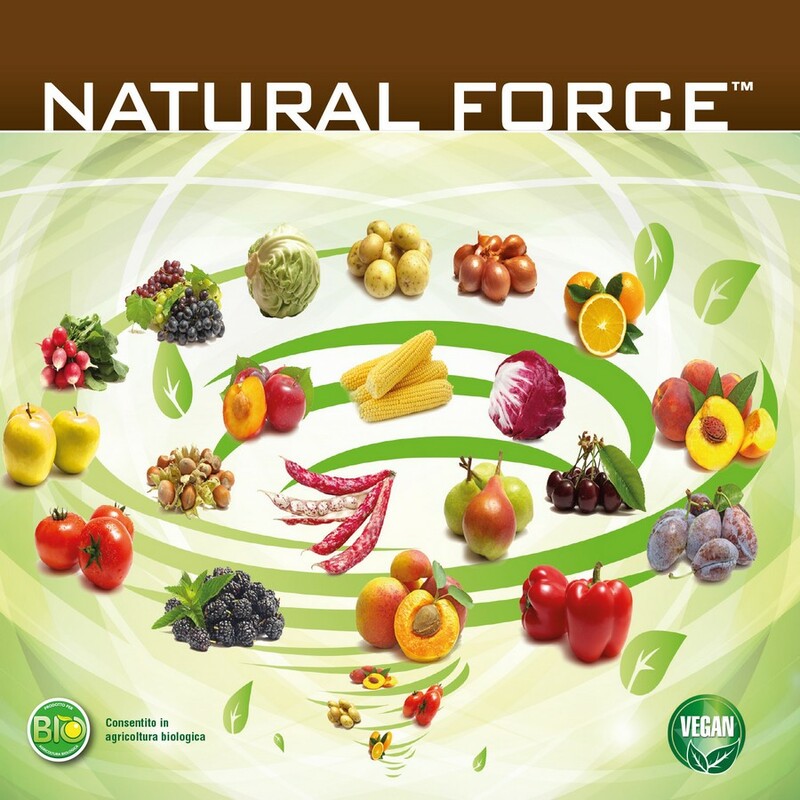 Increase fruit quality with NATURAL FORCE!